This was one of the gifts I got yesterday—I actually bough the same dress in green for my girlfriend. I am in love with brown!!! 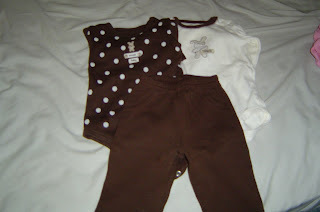 These are hand-me-downs from a friend—but her daughter never wore them. Today is my first official day home and I am washing baby clothes and taking it easy as my hip has decided to completely give out. I’m not complaining though, since, like I said, NO WORK!! Construction has completely begun out front and our sidewalks and driveway were the first to go. I am trapped in the driveway until lunch time. I have no plans until this afternoon though, so it is all good! I can’t belive it is only 9:45; the kids were up at 6:30. I am ready for MY nap!! Finally, I am totally not used to our keyboard at home; it is way less sensitive than mine at work so a lot of my words are ending up with missing letters. Hopefully, spell heck is working! Posted in and then there were 3, maternity leave. Bookmark the permalink. *GASP* Look at that DRESS! And the BROWN! AND THE SHOES!!!! !Ah, I am too, dying from cuteness. And to think! 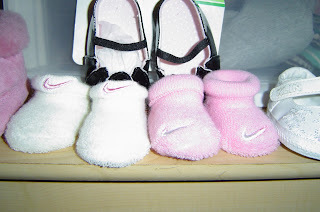 You will soon have a wee bebe to slip those little Nike Booties on. I can’t hardly wait. I love brown too! My oldest looks gorgeous in chocolate brown. She has the brown eyes and it just makes her look so beautiful.I just love hand me downs. With 4 kids, it’s the only way to outfit them all. Glad you’re home. 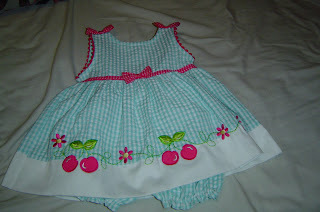 Between my 2 girls, we have about 12 gingham dresses. So cute! All the girly stuff is so cute!!! !I am loving brown too. My diaper bag is brown with blue accents and I LOVE it. Mmmm… Little girl clothes. I eat them up with a spoon! My main reason for wanting a girl next time is that I am a bit tired of boy clothes and want to get up my ruffly little girl jumpers again! LOVE the clothes! And take it easy! Cute cute clothes! 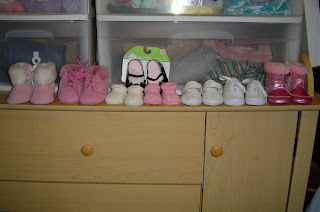 I can’t wait to have a little girl to buy for.